Anna seventh graders Stacey Burke and Ava Bollheimer participate in the Real Money. Real World. simulation recently with activity volunteer, Shelby County Commissioner Julie Ehemann. 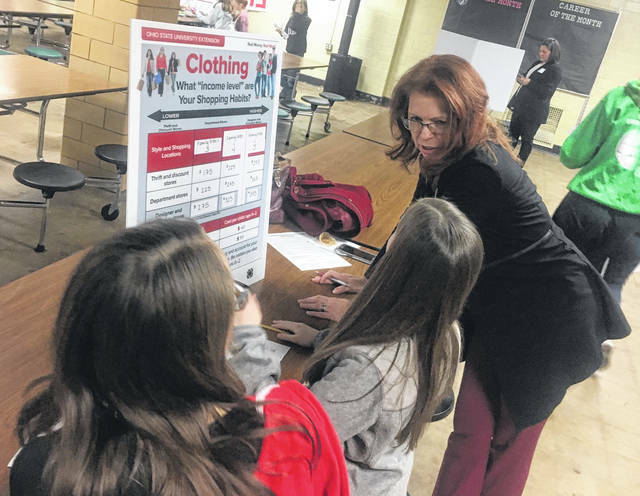 ANNA — Anna Middle School’s entire seventh grade class recently participated in Real Money. Real World., an Ohio State Extension program designed to help youth learn firsthand about cost of living, financial decision-making, money handling and debt. As part of the RMRW simulation, students randomly selected an occupation and family situation. They were then given a salary equivalent to the average monthly salary in their assigned occupation. With this information, students worked through the real-life experience of opening a checking and savings account, making consumer decisions, paying bills, and balancing a checkbook. These activities were completed as students “spent” their salaries for the necessities and luxuries they selected for their adult lifestyle. They were also required to pay taxes and save for the future. RMRW is designed to be a valuable experience for students engaged in the activity. Volunteers from around the community were utilized at RMRW to run the simulation stations that students visited to “spend” their income for things like child care, entertainment, food, housing, insurance, transportation, and the like.